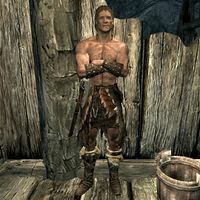 The male Redwater Lookout is a Nord bandit found outside the front of Redwater Den, a drug den for Redwater skooma. "Hey there, friend. If you're looking for a fix, you're at the right place. Just head on down the trap door." "I got nothing on me. If you're looking for Skooma, head on downstairs." "If you're buying, go on in. Otherwise, shove off." The female Redwater Lookout is a bandit archer who guards the back of Redwater Den's exterior, usually sitting on a stump in front of the fireplace near the trapdoor. 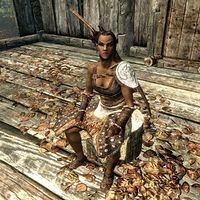 She can appear as either a Redguard or a Bosmer. "You here for the Skooma? Head around inside, there's a trap door that'll lead you in." "Look, I'm just here to keep watch. What you're looking for is down inside." "If you're here for business, go ahead. Otherwise, get lost." If still alive, the two lookouts will be renamed to "Vampire's Thrall" when you leave, and lose their unique dialogue. It is possible for NPCs to be renamed "Vampire's Thrall" on first meeting. This page was last modified on 23 November 2014, at 16:01.